He’s scribbling a series of 12 words on the blue paper handed to him by one of the two women at the other side of the desk. Marco is his name. Graying hair, blue jeans, and still wearing the fat, black winter coat that protected him against the cold Alpine air outside, he just drove 80 kilometers from his hometown and is now in the process of installing the Atlana Bitcoin wallet, as recommended. The woman explains how the machine works, pointing to the small black window that hides a camera and then to the QR code on Marco’s phone screen. Marco nods and gets out his brown leather wallet. As the woman retakes her seat at the desk in front of the bookshelf with copies of Mastering Bitcoin and Antifragile, Marco starts shoving orange 50 euro notes into the Bitcoin ATM. The machine responds with a buzzing and clicking sound for every slip inserted. This goes on for several minutes before Marco puts his wallet and phone back in his jean pockets and walks back to the desk to give a final handshake to both women. “I’d like to get some of my money out of the bank, and bitcoin seemed like a good option,” he says, briefly explaining his investment decision before leaving the shop with a thankful smile. 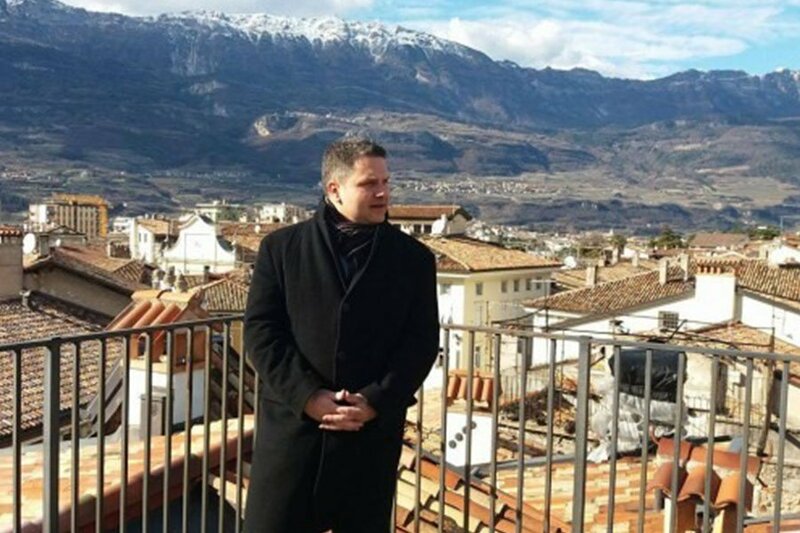 In the same northern Italian town about four years ago, another Marco, Marco Amadori, was discussing Bitcoin with some fellow local enthusiasts. Working on tech projects for the province of Trento, Amadori pitched them a dream. Schooled as a developer, in his late thirties at the time, Amadori wanted to turn Rovereto — the name of his town — into a “Bitcoin Valley,” with Bitcoin companies, bitcoin-accepting merchants and, of course, Bitcoin users. Four years later, Amadori and his fellow enthusiasts own and run two Bitcoin businesses in Rovereto, with a nearby education center and a communication company coming up. Inbitcoin, Amadori’s first Bitcoin business, is a research and development company, working on various bitcoin-related software applications, including point-of-sale payment solutions for merchants and the Atlana wallet. The second, Compro Euro (Italians will understand the pun), is a brick-and-mortar exchange, the first of its kind in Italy. Anyone can walk in to buy or sell up to 3,000 euro worth of bitcoin, on the spot. The service applies full Know-Your-Customer (KYC) identification and charges a 12 percent markup to boot. Italians in and around Rovereto don’t seem to mind. Inbitcoin and Compro Euro are now at the heart of Bitcoin Valley — very literally so, in the case of the exchange: it’s situated right in the center of town, where three streets meet. Hard to miss for anyone strolling around the old brick streets of Rovereto. Amadori, Olivo and other enthusiasts are trying to get a bitcoin economy going in Rovereto. The Inbitcoin and Compro Euro teams get paid in bitcoin and tend to visit the establishments that accept bitcoin more than most others. Their restaurant of choice is often Pizzeria Da Papi, owned by Ivan: a tall, slim man with friendly eyes. 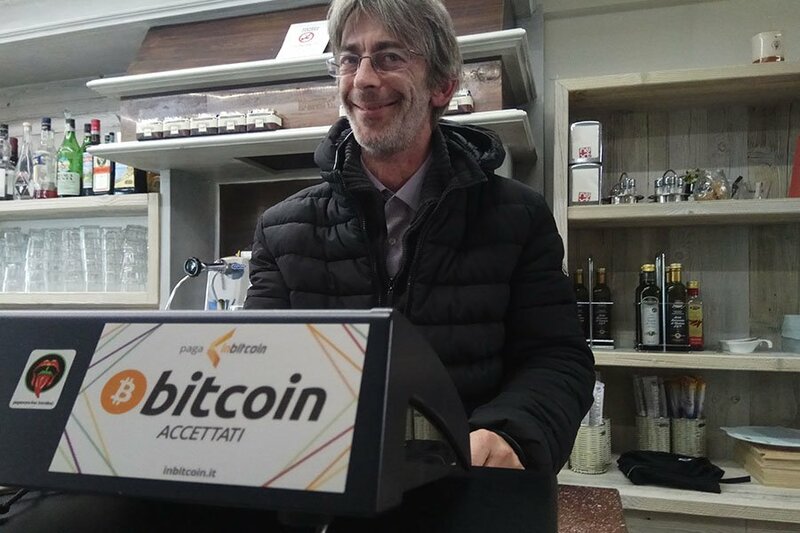 Ivan is one of a growing number of Rovereto merchants who accept bitcoin. Ivan started accepting bitcoin in early 2017 and has kept most of his coins, he says with a wide smile. The price has gone up significantly. But for Ivan, Bitcoin is not just a new payment method or even just a form of money. Having been introduced with the digital currency (and possibly inspired by a thieving former employee, Olivo suggests), Ivan imagines a world wherein the flow of money across supply chains can be traced and automated. As a first step in the shorter term, the pizzeria and Inbitcoin are working on an accounting system. Even if the pizzeria accepts bitcoin for payment, Ivan needs to pay tax in euros. The Inbitcoin payment terminal — a software layer on top of BitPay — lets him convert a percentage of the bitcoins into euros automatically and keeps track of how much tax he needs to pay at the end of the day. 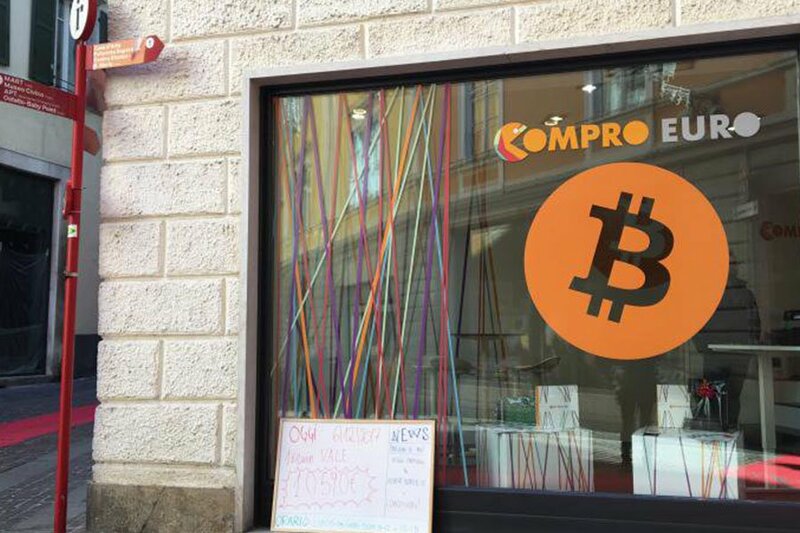 Ivan may be more interested in Bitcoin than most shop owners — but in Rovereto he’s no fluke. From the local extreme sports store (most bitcoin payments are for ski and snowboard gear) to the horse meat butchery, to the newspaper stand at the edge of the town square, the “Bitcoin accettatti” stickers pop up on store fronts across the intimate city center. And while the amount of commerce that takes place in the cryptocurrency is still relatively small, Rovereto has received lots of attention from Italian media. As such, everyone in town is aware of its status as the Bitcoin Valley — even those that don’t care about Bitcoin at all. Merchants were open to Bitcoin in Roverato exactly because it is a relatively small town, suspects Claudio Gobber, the thirty-something chatty senior business development manager for Inbitcoin. It has proven to be such a fertile breeding ground, he thinks, because the small-town familiarity gave local merchants the confidence they needed; Amadori’s family in particular has been living there for generations. And that’s what makes it special, he thinks. 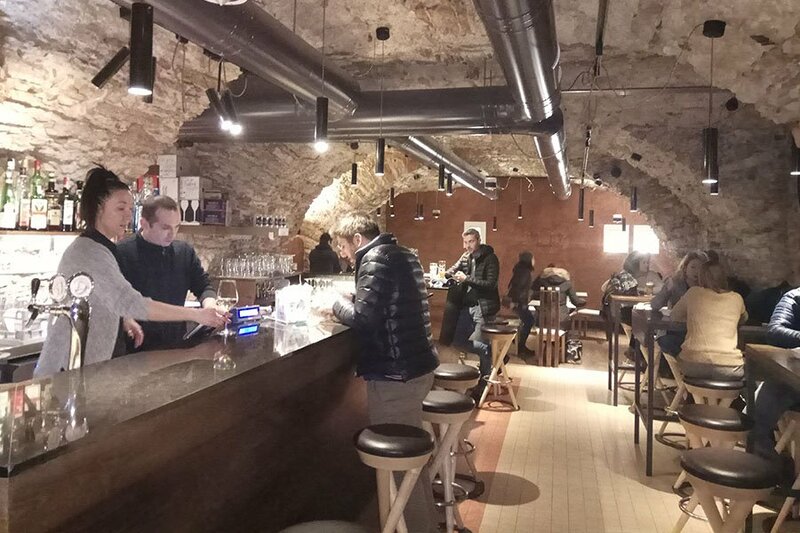 The very first establishment in Rovereto to accept bitcoin was the local bar, Mani al Cielo, back in 2015. It’s still the establishment that receives most the bitcoin payments in town today. Like Ivan, Gianpaolo doesn’t see bitcoin as just a payment method. He is an enthusiast, trading altcoins in his free time to try and increase his holdings. Bitcoin’s volatile nature doesn’t bother him — he enjoys it. “If you don’t like the roller coaster, go with the Caterpillar,” he had told an Italian television crew two weeks prior, comparing the stability of the euro with a kiddy ride in a nearby theme park. “No one is forcing you.” It made him a local Bitcoin celebrity. He’s now having the sentence printed on a shirt like a catchphrase, he says. If you don’t like the roller coaster, go with the Caterpillar. Rovereto is probably getting closer to establishing a circular Bitcoin economy than anywhere else in the world — with Mani al Cielo at the center of the payment carousel. Not only does Gianpaolo take bitcoin from the Inbitcoin crew, who will often drop by after work, but the bar owner has also convinced a local beer producer to accept bitcoin from him. Yet there was no way Gianpaolo would accept Bitcoin’s cheaper offshoot, Bitcoin Cash, he said.